Overnight rains lashed Chennai as Intense Thunderstorms under the influence of wind convergence triggered heavy rains at many parts of the city. 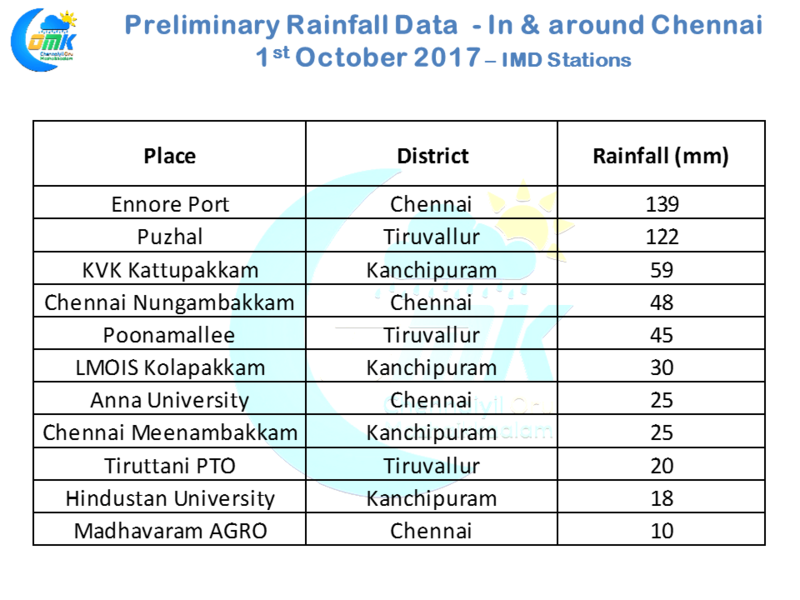 The highlight has to be Ennore Port which recorded nearly 14 cms of which nearly 13 fell in a 3 hour spell between 12:30 AM & 3:30 AM. Similarly Red Hills recorded 11 cms rains of which 10 cms fell in 3 hours between 1:30 & 4:30 AM. Most parts of the city got medium to heavy rains. Yesterday was pretty much a North Tamil Nadu story as far as thunderstorms are concerned in Tamil Nadu with places along the latitude of Chennai and half a degree to the South and North getting the bulks of the rains. The wind instability that has been triggering the rains continues to persist though thanks to the effect of the circulation it is now once again over South AP & Rayalaseema region. Like yesterday the latitude around Chennai has once again converging winds late in the evening which is conducive for thunderstorms. Numerical Models indicate possible influence of sea breeze front as well with a strong sea breeze front expected to move inland creating combustible mixture of wind convergence, sea breeze front and overall support by the circulation over Odisha / North AP. All in all another interesting day ahead for Kanchipuram, Tiruvallur and Chennai districts of North Tamil Nadu.